Man's Search for Meaning has riveted generations of readers with its descriptions of life in Nazi death camps and its lessons for spiritual survival. Between 1942 and 1945 psychiatrist Viktor Frankl labored in four different camps, including Auschwitz, while his parents, brother, and pregnant wife perished. 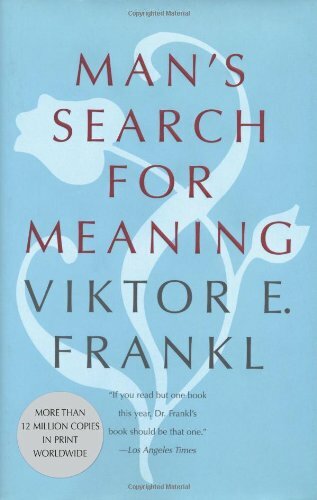 Based on his own experience and the stories of his many patients, Frankl argues that we cannot avoid suffering but we can choose how to cope with it, find meaning in it, and move forward with renewed purpose. Frankl's theory--known as logotherapy, from the Greek word logos ("meaning")--holds that our primary drive in life is not pleasure, as Freud maintained, but the discovery and pursuit of what we personally find meaningful. "What man actually needs," Frankl writes, "is not a tensionless state but rather the striving and struggling for a worthwhile goal, a freely chosen task . . . the call of a potential meaning waiting to be fulfilled by him." In the decades since its first publication in 1959, Man's Search for Meaning has become a classic, with more than twelve million copies in print around the world. A 1991 Library of Congress survey that asked readers to name a "book that made a difference in your life" found Man's Search for Meaning among the ten most influential books in America. At once a memoir, a meditation, a treatise, and a history, it continues to inspire us all to find significance in the very act of living. "One of the ten mostinfluential books in America." Born in Vienna in 1905, Viktor E. Frankl earned an M.D. and a Ph.D. from the University of Vienna. He published more than thirty books on theoretical and clinical psychology and served as a visiting professor and lecturer at Harvard, Stanford, and elsewhere. In 1977 a fellow survivor, Joseph Fabry, founded the Viktor Frankl Institute of Logotherapy. Frankl died in 1997. Harold S. Kushner is rabbi emeritus at Temple Israel in Natick, Massachusetts, and the author of several best-selling books, including When Bad Things Happen to Good People, Living a Life That Matters, and When All You've Ever Wanted Isn't Enough. William J. Winslade is a philosopher, lawyer, and psychoanalyst who teaches at the University of Texas Medical Branch in Galveston and the University of Houston Law Center.